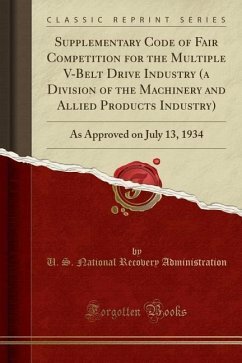 Excerpt from Supplementary Code of Fair Competition for the Multiple V-Belt Drive Industry (a Division of the Machinery and Allied Products Industry): As Approved on July 13, 1934 Sir: This is a report on the Supplementary Code of Fair Com petition for the Power Transmission Subdivision Of Machinery and Allied Products Industry, a Public Hearing on which was held in Washington, D.C., on December 21, 1933. The Hearing was con ducted in full accordance with the provisions of Title I Of the National Industrial Recovery Act. About the Publisher Forgotten Books publishes hundreds of thousands of rare and classic books. Find more at www.forgottenbooks.com This book is a reproduction of an important historical work. Forgotten Books uses state-of-the-art technology to digitally reconstruct the work, preserving the original format whilst repairing imperfections present in the aged copy. In rare cases, an imperfection in the original, such as a blemish or missing page, may be replicated in our edition. We do, however, repair the vast majority of imperfections successfully; any imperfections that remain are intentionally left to preserve the state of such historical works.